Let’s face it the cost of inkjet printing isn’t cheap. But being able to print your photos can bring pleasure and add an extra dimension to your photography. Often, it’s only when you hold the finish printing your hands that you can really appreciate the image you’ve created. When it comes to selecting an inkjet paper for photo printing, the choice can be bewildering. In this article I’m going to set out a few of the important considerations that will help you make your choice. Before we examine the various considerations, you should understand if you’re using a dye or pigment-based inkjet printer. Dye based printer inks tend to be cheaper than pigment printers which are generally aimed at the professional user. Dye inks are cheaper to manufacture and use smaller molecules of colour. This means they tend to be absorbed deeper into the paper. Pigment inks in comparison have much larger molecules which sit on the surface of the paper. Know your printer. Dye or Pigment ink? Not all papers are suitable for pigment or dye inks. Pick the wrong paper for your printer and your results could be compromised. Fortunately, many papers today will support both dye and pigment ink printing. It’s still though important to understand if your printer is a dye or pigment printer and ensure the paper is compatible with this. What’s your budget for purchasing photo paper? Some paper types are much more expensive than others and the most expensive papers aren’t necessarily the best. Matte papers for example tend to be cheaper than gloss or lustre finish papers. Baryta papers can be much more expensive as can fine art cotton-based papers. A large element of the price is the cost manufacturing the paper and another component are the features that someone in the marketing department thinks they can charge more for. Some papers such as cotton-based fine art papers, will have the neutral pH and be certified as acid free. They may also have guarantees about the longevity of the print. Now think about this carefully, do you really need all these features? Yes, an acid free paper wont yellow and the image may last much longer. But if all you want to do is make a few nice prints to share with friends at a photography club, do you really need a guaranteed print life of a hundred years plus. You may be paying for something that you don’t need. It may be better to buy a nice, cheaper paper and make more prints. Think carefully before you spend money on expensive papers. Standardising the paper you use for photo printing is also an important consideration for many. When you standardise your paper, you’re able to develop a much simpler workflow for making consistent prints. Alternatively, you may want to use different papers, matching the characteristics of each to the type of print you’re making. If you want to standardise your paper you may well be better investing in a cheaper paper with general characteristics suited to general photography. Think now about the purpose of your print. Some types of print demand certain types of paper. For example, if you’re making fine art prints to hang on the wall it’s likely you will need to use a paper such as a photo Rag paper made from cotton. It will again likely have a long-guaranteed print life, be free from optical whiteners, have a neutral ph. and have a matte surface. If your printing black-and-white you may feel that a traditional Baryta based paper is more appropriate. But if your printing to enjoy and show your work to others, a general paper may be more suitable than a specialised (expensive) paper. In which case, you should think carefully about the paper surface. Let’s consider the paper surface options you have available. Matt surfaces tend to be course and not reflect light. This is useful in cutting down reflection and probably why most Fine Art papers have a matt finish. You want to hang prints that are easy to view from any angle. When printing to a matt paper, colours can appear dull and a little dark when compared to a monitor. Blacks tend not to be as dense and deep as with other types of paper but there can be a tendency for shadows to block up a little. Because of this some printers have special matte black inks installed which are darker than the ink that’s used for gloss paper. If your printer doesn’t use matte ink you may find printing to matt paper is a little disappointing when compared to the image on your computer screen. Matt papers tend to be cheaper than the equivalent gloss paper, but can be more demanding to soft proof. Often, they will require greater adjustment to make the print appear the same as the screen image. Gloss papers have a shiny surface that can reflect light but this can also detract when viewing the image. The big advantage of gloss paper over matt is that the blacks appear much darker and the image has more contrast. Gloss papers support a much higher dynamic range the matt papers. The dynamic range is the difference between the darkest area of the image and the lightest. With a greater dynamic range your images appear to have better contrast and are often more appealing. Another advantage of gloss paper is that it tends to display more detail than the equivalent image printed on a matt paper. If having very detailed and sharp images is important to you, a matt surface may not be the best. The lustre surface has similar characteristics to gloss but tend not to be as reflective. This can be helpful in reducing glare but not every lustre surface is attractive. You may find that lustre surfaces are also referred to as Perl by some manufacturers. Baryta papers tend to be much like traditional darkroom papers. This type of paper is very good for printing black-and-white images and has sharpness and detail qualities like the gloss surface. Fine art papers tend to have a matte surface, but the surface may feel more velvety than a standard matte paper. These papers tend to also have good dynamic range and colour qualities when compared to standard matte papers. They don’t though match up to gloss lustre Baryta papers. Metallic papers area relatively new development for inkjet printing and have similar surface characteristics to gloss paper. They can be produce nice results and give a 3D effect to some images. Personally, I think this type of paper doesn’t suit every image and I have even grown a little tired of the effect. The feel and weight of the paper is another important consideration. Many people I speak to appear to judge a paper by its feel. This may be misleading depending on the purpose of your print. If your photo print is going to be displayed behind glass, it doesn’t really matter how the paper feels. A stiff paper with a nice texture may only induce you to pay more for paper when a cheaper paper may be sufficient. The quality of the print may also mislead you into thinking the paper is much more expensive than it is. An example of this from my own experience is where I have used a very cheap matt paper to print photos for sharing at camera clubs when giving presentations. The paper I used cost me £29 for 100 A3 sheets and produces excellent prints. The question I’m constantly asked is what is this paper as it’s really nice. When there’s no print on the paper, the paper doesn’t feel to be high-quality at all. Whilst the weight of the paper adds to the feeling of quality, it may also cause problems. Heavy papers over around 300gsm may cause difficulties for some printers. Heavy, thick and stiff papers can slip and sometimes cause scuff marks to appear on the surface where the printer rollers couldn’t grip well. If you’re going to print with heavier card like papers, make sure your printer can handle these. Usually anything below 300gsm is okay for most printers. The base colour of your paper is also very important to the appearance of the finished image. Some papers have a warm feel to them whilst others are neutral, or even have a blue tint. The whiter and brighter papers tend to have optical whiteners added, which may degrade the print over time and limit its life. This of course may not be a concern if you don’t need your prints to last for many years. The other reason for the base colour of your paper being important is because this will show through as the white in your image. If you use a warm paper, whites will appear warm but use a blue tint paper and whites appear cold. A paper may look very nice for black-and-white prints but when printing colour the effect could detract from the print. An important but often overlooked factor to consider when purchasing photo paper, is access to printer profiles. A printer profile is a data file for your computer that allows the colour in your print to be accurately interpreted to match the image on your computer screen. Printer profiles are an important part of the soft proofing process. They allow you to display the image on screen as if it were the finished print (which usually looks different to your edited image). It’s then possible to adjust the soft proof image to make it match the edited image. This adjustment process is known as soft proofing and is critical to making the printed image match the image you see on screen. If you don’t have the ability to create printer profiles, you will need to rely on the paper manufacturer providing these. These printer profiles must match the paper and printer combination. Each printer and paper combination will require a printer profile. You can’t use a profile from either another printer and paper and expect the results to match your on-screen image. Creating your own printer profiles is easy but requires special software and hardware. This is quite expensive so it’s often much better to use a manufacturers profile. The manufacturer supplied printer profiles are often referred to as generic profiles. 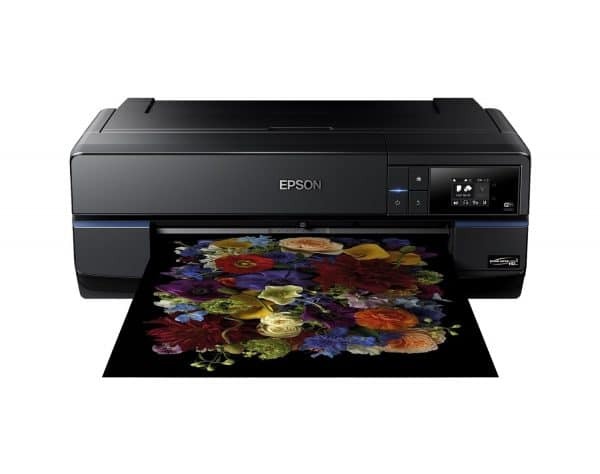 This is because they are created to match the average printer model for example an Epson 3880 printer. There can however be significant variation across printers of the same model due to manufacturing tolerances. This variation can cause differences in the finished print so many people prefer bespoke colour profile created for their printer. Some paper manufacturers now offer a bespoke printer profiling service for their papers. The cost of this can vary but some now offer this service for free when you buy their paper. Fotospeed and Permajet both offer a free profiling service with their papers. I have tried both and they are excellent. If the paper manufacturer doesn’t offer a profile for your paper and printer combination, you will most likely need to invest in having one created. Although this article is about selecting suitable papers for inkjet printing, many people have given up on printing altogether. Often this is in total frustration having invested lots of money and time in trying to produce prints which never really impress or which fail to look like their screen image. There are lots possible causes for this but often it’s a simple problem which can be easily corrected when the right process is adopted. If your struggling with printing or find your results are hit and miss, I would urge you to consider my book “Perfect Prints Every Time”. It’s available on Amazon and costs less than a photography magazine in the Kindle format. Even if you don’t have a Kindle, you can still benefit from the book using the free Kindle reader software on your computer, tablet or phone. This book can save you a lot of time and money as well as helping you produce impressive prints. Epson Archival Matte – a very good all-round matt paper although at 192gsm some people may find it a little light. It also has a lower dynamic range than the more expensive Hahnemuehle paper below. Permajet Matt Plus 240 – a great all-round paper which is very good value. This often draws favourable comments from people. Fotospeed Matt Ultra 240 – Virtually identical to the Permajet Matt Plus 240 above and another great choice. 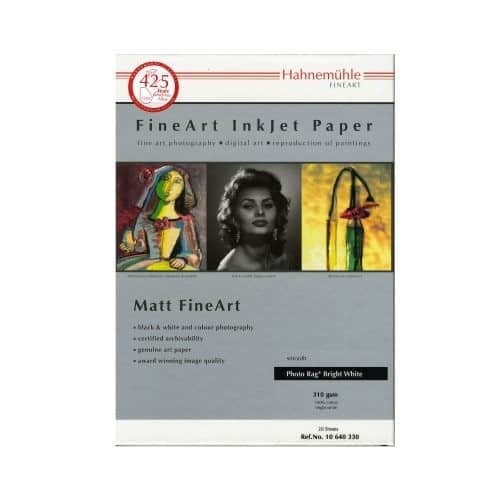 Hahnemuehle Bright White Photo Rag 310 – This is a superb fine art paper with a great dynamic range and colour rendition. It’s not as cheap as the above papers but is still good value. If I’m making a print to hang, this is the paper I use. Ilford Galerie Gold – A wonderful paper that gives a real depth to prints and makes them appear as if you could reach into them. Ilford paper did go out of business at one time but I believe they are making a return. Fotospeed Pearl 290 – This is a great value paper with a lustre or pearl type surface. It’s very similar (probably identical) to the old Ilford Galerie Pearl papers. Permajet Photo Art Pearl 290 – This is my absolute favourite paper of all. It costs but it’s worth it. The paper has a very faint sheen to the surface but it's almost matt in appearance. Firstcall Baryta – Firstcall Photographic has recently started to produce its own brand Baryta paper. It’s excellent value and very, very good. As you can see, there are a lot of considerations when selecting a suitable inkjet paper with which to print your photos. But take your time and work these through in sequence and you will quickly arrive at several viable options. It’s also worth keeping in mind that many paper manufacturers offer sample packs. These are often good value and allow you to try out the various papers. Do though be sure to use the relevant printer profile or a meaningful print comparison will be impossible. Thanks for this much-appreciated article Robin, really helpful. Thanks for this concise but quite comprehensive article on inkjet papers for photo printing. I’ll have to include some of your recommended papers in my own efforts. I’m pleased to hear tis has given you some ideas. I would really recommend the Ilford Gold or the Permajet Baryta papers if yo haven’t tried them before.